Sicario features an opening sequence that hits heights of intensity other films can only dream of hitting in their final act. And it does this before we even know the protagonist's name. To the sound of a repetitive drumbeat increasing in volume, we follow an FBI task force as they raid a house. They break down the front door, and shoot a man dead. We think the action is over. Then our protagonist enters another room, and is shot at. She dodges the bullet, and shoots the second man dead. Again, we think the action is over. Seconds later, a high number of decaying bodies are found inside the walls of the house. The action calms down, the characters begin to talk to each other, we start receiving some information on who these people are and what is unfolding in front of us. Before we can settle down, another character discovers a trapdoor in an outhouse in the garden. As our protagonist walks towards the outhouse, a bomb explodes. Finally, the action stops. But after Sicario has tricked you into a false sense of security that many times, this early in the film and with characters we don't even know yet, you will not be able to sit comfortably for the following two hours. After this frighteningly good opening sequence calms down, Sicario begins to get its story moving. FBI SWAT agent Kate Macer (Emily Blunt) is invited by CIA officer Matt Graver (Josh Brolin) to join his task force, where she will assist him in tracking down the men responsible for what happened at the house. Due to her idealistic nature, and determined to make a real difference, she takes the job, but immediately has difficulties in accepting how different this task force is from her old one. Kate repeatedly comes into conflict with Matt and his partner Alejandro (Benicio del Toro), a man who she can neither trust nor decide who he really works for. All the groundwork is there for Sicario - which the film informs us in both its marketing scheme and its opening titles is the Spanish word for "hitman" - to be yet another basic, by the books thriller that tells a fascinating story with an annoying simplicity. But boy could this be further from the truth. Sicario is a tight, intelligent, character driven, relentlessly intense, cliché-smashing thrill ride that, even in its quietest moments, scarcely cuts you a break. To be entirely honest, it's bloody exhausting. Part of what makes Sicario so refreshing within its own genre is the attention to visual detail. Whilst a simple visual style can sometimes be satisfactory, a film telling a story this powerful needs to be visually striking too. 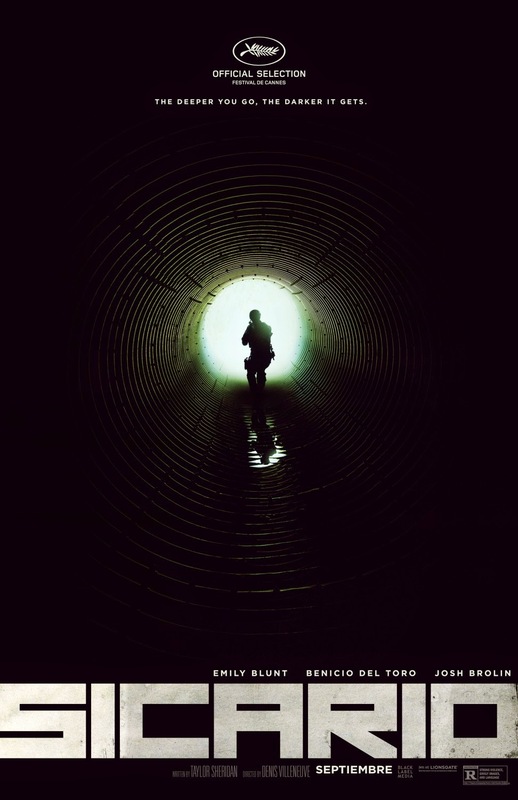 Sicario doesn't really do anything new visually, it just does everything very, very well. Establishing shots are positioned from above, tracking over wide environments from a birds eye view with small details such as the shadow of a helicopter or a flashing police light punctuating the edges of the frame. Scenes entirely out in the open, such as a particularly intense shootout in a traffic jam on a highway, are given a stark sense of entrapment and claustrophobia. Despite how wide and open the environments are shown to be from their aerial establishing shots, the film has no difficulty in suddenly make them seem small and inescapable as soon as it needs to. There's also an especially clever moment in which, while mid sentence, the camera shifts focus from del Toro's face to a wall plastered with Missing Child posters. It's a simple yet highly effective touch that fully reinforces this film's environment without resorting to exposition or exploitation. Pale colours dominate each and every frame, so much so that any sprays or drops of blood have enough visual contrast to throw the entire shot off balance, creating an impressively disorientating feel. What cinematographer Roger Deakins has done with this film is truly remarkable. But none of this would have any real benefit if Sicario were badly written, with a weak story and dull characters. Luckily, none of this is the case. Sicario's script, by debut screenwriter Taylor Sheridan, is focused and entirely gripping. It complements its story nicely; much like Blunt's Kate, the audience is kept in the dark as to the real motives of the task force she is now operating in. Sheridan's script accentuates this, we rarely have a scene that doesn't feature Kate. We know no more than she does, meaning when she finally begins to uncover important information, we suffer the same shock as her, and at the same time. It also helps that Kate is a genuinely likable character, bolstered powerfully by how much she shatters the 'strong female character' archetype. Rather than become a hero herself and earn the respect of the men around her, Kate never backs down. She never resorts to sacrificing her own beliefs or attributes in favour of a higher position. She is a character who knows who she is and what she believes in, and even when she realises that her new job will never go how she wants it to, she sticks by herself and refuses to change. Kate is built on some really compelling arguments, and offers a representation of the 'strong female character' unlike any seen in recent years. Sicario's production companies pushed and pushed for her role to be switched to a male, but thankfully this didn't pull through. It's tough to imagine this film without Blunt's assured, dedicated and empowering performance. She isn't alone, either; Benicio del Toro is also excellent. While his character is left mostly on the outskirts for the film's first two acts, the genuinely shocking narrative twist that dominates Sicario's final half hour gives him a tonne of interesting stuff to work through. To give any more away would verge on spoiler territory, so I'll simply say that I could not predict any of it, and this film somehow manages to surpass everything it'd already thrown at us to deliver one hellishly dark, brooding, intense final act. Another element that really works in the film's favour is its narrative pacing. Despite its energetic opening sequence, the actual story of Sicario unfolds slowly, but is held aloft by this relentless tension that point blank refuses to show any signs of fading away. Yet, unsurprisingly, this benefits the film. We only really uncover the mission's real motives with less than a quarter of the film left, but this keeps the simplistic three act structure feeling fresh rather than predictable. The first two acts work because we know this game changing reveal is coming, the third works because this game changing reveal sticks the landing seamlessly. Sicario is a film almost too dark to appeal to the masses. Its relentless tension and heavy subject matter, accompanied by a brilliantly ominous soundtrack consisting mostly of soft drumbeats and loud electric notes, make it border on frightening at some points. It's difficult not to come out physically shaken by the preceding two hours. But I also can't shake the feeling of excitement over how fresh and unpredictable and unapologetically dark this film is. 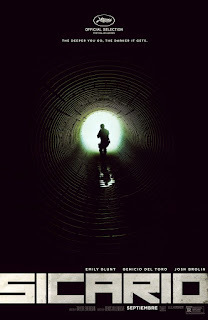 While Sicario does offer some terrific set pieces - the opening house sequence, the traffic jam shootout, Kate's struggle with a man in her flat, the tunnel raid, and del Toro's game changing final sequences make up the film's best moments - its focused more on how these events affect the characters, and this is what allows it to succeed completely not only as a thriller, but as a film on the whole. Unlikable characters can't be funny in comedies, and we can't fear for them in horrors or want the best for them in dramas. In thrillers, we need to care for and understand the characters in order for the story to be engaging, to thrill us. Sicario knows this, its entire story is bound to its three leads, each of them responding differently to everything that happens across this film. It is, quite simply, a breathtaking genre achievement and an outstanding showcase for everyone involved; one of the year's very, very best. To Summarise: Bolstered by assured writing and direction, strong performances, clever aesthetic choices and relentlessly heart-stopping intensity, Sicario is a seamlessly bold, brave thriller that shatters clichés and expectations across its compellingly dark story.